The film is a spin-off from the Death Note and Presents the "final 23 days of L." The mystery the world wants to know will be revealed. After solving the Kira case in Death Note, another serious one finds L and he only has 23 days left to solve it. A boy and a girl hold the key to solving the case and L faces a crisis of global magnitude to protect the kids. L is without his trusted partner, Watari, and to solve the case all by himself for the very first time. What will happen to L? What will change? The 23 days are packed with turns of events even L himself cannot predict. Sadly rather disappointing. I knew that it will not be as great as the Death Note movies, but I still thought that another adventure with L could only be good. But except for some minor references to the Death Note movies, this movie could be set around any set of characters. Though it is supposed to center around L, I had the feeling, that he had a bigger role in the Death Note movies, than in his own film. Also it feels more like L is just going along with the flow of the events. It doesn't feel like he has any major influence here. His skills of deduction are sadly rather underused. As I said, it could be any other character in the center of this movie. It wouldn't have needed L. It feels a little like they had already a script for another movie and after L was such a fan-favorite character in the Death Note movies, they made little adjustments in the script and used it for an L movie. Minor spoiler for this movie (spoiler tag inside spoiler tag doesn't seem to work): As anybody who has read the manga or has seen the anime probably guessed at his first appearence, the small boy which is with L during most of this movie is Near. After a lot of hints during the movie it is spelled out for the viewer when L takes him to Wammy's House and gives him the name "Near". The rest of the movie he was simply referred to as "boy"
A wonderful story about angel-like creatures - with beautiful animation work. A girl finds herself, after having some strange dream, coming out of a cocoon with small wings on her back. 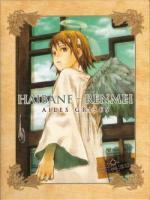 She has lost all memories of her previous life and now must find out what it means to be a "Haibane" (this is how these creatures are called). Misou managed to get through all of high school and college without a grilfriend. A wizened fortune-teller has predicted that it is his destiny to be alone for his entire life! When Misou sees the beautiful Nagisa, his heart is awakened for the first time. He has serious competition in the form of the flawlessly handsome Kaizuka and the amazingly ugly Kujira. Misou is determined to succeed, but he is stalled by his knack for ending up in compromising situations with other woman at exactly the wrong moment. This collection are two separate series, which both take a different take on the same source material. First, we have a 3-episode OVA series: On this the animation is well-done and the story is told from a more serious and romantic angle. Then we have a TV series with 16 mini-episodes (about 7 minutes each): Animation overall is not as good as in the OVA but due to its more comical take on the story, it had a lot of good laughs (often from good visual gags). Due to its structure, the story continues mostly as "1 step forward - 1 step back" for the main character. Usually each episodes end with a cliffhanger, which is resolved in the beginning of the next episode. Due to the short length of the episodes you are at, before you know, yet another cliffhanger. Overall I can say, it was another 12 bucks well spent. For those of you who still haven't seen this movie, because either of the non-RC1 issue or because you do not like watching movies with subtitles ( ): Soon there is a RC1 release coming for the first Death Note movie. It contains both the original Japanese language track and an English dubbed track (with the same voices as the English version of the anime). What can I say: I love it!!! Great Japanese comedy series I can highly recommend. If you remember, I recently watched the anime series of this after a lucky blind buy. This series is even better than the anime. The actress who plays the main character is simply perfect in the role. What makes the series so great is the combination of the line delivery by main stars, editing and camera work. I had to laugh out a lot in most scenes thanks to the great direction on these (and that even though I am watching the series for the second time). This show does not only offer comedy but also a little drama. Which is often on the cheesy side but it really works here. The only minor critique I have is, that the grandfather of the main character is too much of a nice guy to be the head of a Yakuza clan. Sadly I did not find any YouTube material which does the show justice. Here is a best of montage, but of which I think that the shown scenes are hardly best of material of this series. There would have so much better stuff. If I have even remotely sparked your interest, I recommend that you follow the link provided in the description in both of the above YouTube videos. It will lead you to a site which offers fansubbed versions of the episodes. This is how I come to know this series the first time around. This series is about a girl, Haruhi, who acts like the whole world revolves around her. What she doesn't know, it probably does. Three years ago she wished herself, that there would be things like aliens, time-travellors and ESPers (psycics) in her world for her to meet. Because of this wish, these things do exist. As a matter of fact, the school club she has founded (which goal is to find aliens, time-travellors and ESPers), has an alien, a time-travellor and an ESPer in it and she doesn't notice it. The job of these individuals is to make sure, that Haruhi is happy with the world as it is and is not bored with it. You never know, what she would wish next otherwise. Maybe the end of the world? This series is really funny. Especially how forceful Haruhi is with her fellow club members. It is told from the point of view of the only "ordinary" member of her school club "SOS Brigate" (Spreading Excitement All Over the World with Haruhi Suzumiya Brigade) who narrates the story. What I find disappointing with the DVD release though (and that is not necessarily the fault of the US publisher, because it also was this way with the Japanese DVD release), that they are using the chronological order of the episodes and not the order they were aired. Originally the main story arc was told in six episodes spread out over the season with single self-contained stories in-between (which happen after the main story). But on the DVD they start with an episode which is totally different from the rest of the series (Episode 0) which shows a "movie" the main character have made. It's a little strange going in, but after getting to know the character during the rest of the series, this episode has a lot charm to it. After it they bring the main story's six episodes. Which ends with a nice emotional conclusion. Then after that they bring the rest of the episodes with single story lines which go nowhere particular and therefore the season ends on a low note. But nevertheless it is totally worth to watch. I just did a little browsing at YouTube and encountered countless videos of people performing a song from this anime. Which shows that the show is really huge in Japan. If you look further (e.g via related videos), you will find tons of videos of this song played by High School bands or the guitar part played by countless other people. The mother of all destiny. Her son, the future leader of mankind. Their protector, a Terminator from the future. Together they must take back the future as Sarah Connor (300's Lena Headey) prepares her son to fight the war against machines determined to annihilate the human race. The Clock is ticking. Can they stop Judgement Day? I think it's a great series. When I saw the pilot when it first appeared on the internet, I really liked it. I was hoping that the rest of the series holds up. And I think it did. Cannot wait for season 2! How did the Cromartie terminator travel to the future when it was already blown to pieces and thus not covered by "living tissues" anymore? Now I am hoping that Arnie will turn up in a cameo. I imagine a scene set in the future where we see how John sends the re-programmed Arnie back in time for Termintor 2. This series put me in the mood to watch T1 and T2 again. Maybe I will do it soon. I like your idea for an Arnie cameo. It would make sense for the series to end with a shot of him being teleported back. It's a while since I saw the pilot, but he got blasted into the future! Yes, but we have learned in the movies, that only living tissue can travel through time. That is why people arrive naked and only flesh-covered Terminator and not other machines and weapons can travel through time. So how did the skull travel through time? This question has been asked sooo many times before. In T2, Cameron never actually showed us how the T-1000 arrived, which has led to the 'skin-sac' theory, done off-screen to not give away what Robert's character actually is; or that Cameron either forgot about the living tissue rule, or was just messing with everyone's heads. In T3 the rule was ignored because the director was a lazy moron who just wanted a carbon copy of T2 with a more pc villain. 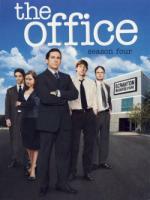 Another season of The Office that I enjoyed very much. When this series started, I did not think that it would become a series which is not just a cheap remake of the original. But now in season 4 they are still going strong. Due to the writer's strike this season was a couple of episodes short. But five of the episodes are twice the runtime as usual which makes it like watching 19 instead of 14 episodes. Also there are a lot of deleted scenes available. About 10-20 minutes per episodes. These were obviously cut for time and and not for bad quality. Immortals, they have secretly dwelt among us for thousands of years but their origins have been shrouded in mystery. The answers, Prophets say, are to be found in The Source. The last band of eternal warriors, lead by Duncan MacLeod, the Highlander, have set out on a treacherous quest to find the origin of their immortality. But to learn the truth, they must first defeat The Guardian of the Source, a powerful killer who will destroy all who seek its secrets. "How bad can it be? ", I thought. After only reading bad reviews about this movie, I expected the worst. This movie is bad, but not as bad as I had expected. But nevertheless I cannot recommend it one bit. 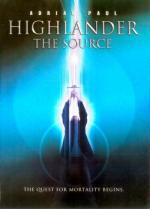 The Highlander franchise doesn't have a good track record when it comes to movies. After one good movie, other movies followed which seemed to have forgotten what Highlander is about. The TV series, although not necessarily of top-notch quality, did get it, what Highlander is about and what fans wanted to see. Now this movie has again forgotten it. No real flashbacks to the past about MacLeod, badly choreographed sword fights. And a story which is worse than any episode of the TV series. Duncan has married a mortal woman, who knew about him and also that he couldn't get children. But then she left him, because she wanted to have children. In what day and age are we? Never heard of adoption or artificial insemination? Couldn't really have been love then. And a movie which has to end on a recap of the entire movie because of fear you wouldn't understand the ending otherwise. Always a bad sign. That reminds me that I have to finalize the TV show. I've never seen the last season. Meet Eikichi Onizuka, a 22-year-old virgin and ex-biker. He's crude, foul-mouthed, and has a hair-trigger temper. His goal: to be the Greatest High School Teacher in the World! Wait, what?!? 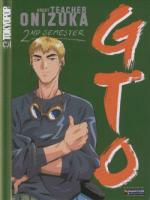 GTO is the fan-favorite story of Onizuka, a former motorcycle gang member whose goal is to become a teacher to make a difference. Once he's got his foot in the school door...can he squeeze his big head through it? Watch in awe as Onizuka pummels through his teacher training only to be faced with the mammoth task of actually landing a teaching position. With unusual circumstances on his side, he just might pull it off. 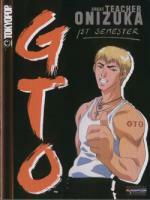 Using his street smarts to deal with colleagues, students, and troublemakers, Onizuka finds that he has too many lessons to learn! This anime series is an adaption of the first 14 volumes of the manga. It follows fairly close the manga, only changing some story elements to soften it a little (AFAIK they allowed to be more crass in mangas than in animes in Japan) and extending others. Also some ideas were taken from the live-action version which came one year earlier. It had its high and lows for me but overall the anime is good. Sometimes the animation style bothered me a little and I think they had dumbed down the character Onizuka too much on some occations. He was too gullable in some cases compared to the manga version. Too bad that they made this anime while the manga was still running and therefore it does not cover the full manga story, but the new ending they devised is fitting (I haven't read the ending of the manga yet, so I am curious how that one will end). I can understand that they make anime series based on mangas while the manga is still current and popular, but it is always sad that the anime is cut short or differentiate from the manga because of this.